SAYAWIT 2012 started with the singing competition followed by the dance. Cultural Dance was the first category to start up the dance competition. Last SAYAWIT 2011, IAS Dance Company was the CHAMPION of the MODERN DANCE CATEGORY and 1ST RUNNER UP of the CULTURAL DANCE CATEGORY. And this SAYAWIT 2012, it happened AGAIN! STILL UNDEFEATED in MODERN DANCE CATEGORY as CHAMPION and in CULTURAL DANCE as 1ST RUNNER-UP! For that, we, the FEU IAS Dance Company would like to thank everyone who supported us and gave us strength to do our best in our every performance. SAYAWIT is a sing and dance competition inside the premises of FEU - Manila for FEU students. Specifically, it's an inter-institute competition. Wherein, Institute Student Councils will choose who will represent their respective institutes but it's more applicable for singing competition. In Dance Category, every institute has its own dance company and they will automatically represent their institute for the SAYAWIT Dance Category. SAWAYIT is divided into two categories; the MODERN DANCE and CULTURAL DANCE. ASIAN-THEMED Dance for the Cultural Category and FIERCE and GOTH-THEMED Dance for Modern Category. IAS Dance Company goes to Marilao, Bulacan! As an annual activity of FEU IAS Dance Company, This year's Team Building was happened last October 17-18, 2012 at Casa Elum Resort, Marilao, Bulacan. The proponents of this team building were Vince Lupango (IAS DC Auditor) and Marie Arnulfa Sison (IAS DC PRO Internal) with the help of their co-officers. The major objective of this team building is to unify all members of IAS Dance Company. To aim the objective, IAS DC officers come up with the idea of obstacle courses or what they called “stations”, other outdoor games and night gatherings such as Mr. and Ms. IAS DC Team Building and Open Forum (Bonfire Activity). The members of IAS Dance Company were divided into four groups or what they called “elements”. It comprises of Amihan, Bukal, Alab and Patag. This will be their groups until the end of the team building activities. Dante ”Ali” Layante is the Mr. IAS DC Team Building 2012 from team Bukal while Krysylyn “Klek” Mendoza is the Ms. IAS DC Team Building 2012 from team Alab. 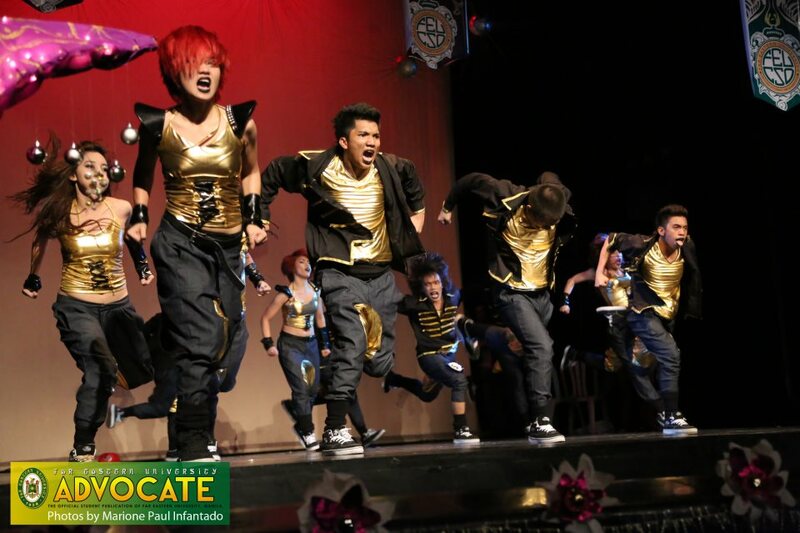 FEU IAS Dance Company continues to share their talent through TV shows and Off Campus events. FEU IAS Dance Company continues to share their talent through Television shows, events outside the FEU Campus and more. After the Gangnam Style video of IAS DC, the group was recognized by event coordinators and talent coordinators of different shows. The group was contacted by GMA-7 for the Jessica Soho show, to spiel their Gangnam Style segment. Then another invitation from the said network also called the group for the same segment but in the GMA New TV channel for the i-Juander show. The FEU IAS DC was also performed in the different off-campus events; they performed at the Amoranto Performing Arts Theater and At Decagon Silver City, Tiendesitas for the Perxclub Exclusive Launch. Recently, they were invited to perform on Good Morning Club TV5 (October 4, 2012) to dance with Grace Lee as she celebrates her birthday (video on this post). IAS Dance Company: Invading History! Oppa Gangnam Style video of IAS DC enters the YouTube CHARTS! IAS DC recorded a video for the Gangnam Style song by Psy. The video was taken last August 28, 2012. The idea came from the IAS DC Alumni Reika Ibasco and Nasmyth Yambao. It was led by IAS DC Treasurer and Ultimate KPop-er Katrina Dignadice (the girl in black). The video was uploaded in YouTube Channel of Reika with the username 'yheuniz' last August 30, 2012. It was shocking for IAS DC that the video will BOOM the world wide web. The views increase so fast. It reached 1.3k+ views in its first 4 hours then reached 14.7k+ views in 2 days. And because of the continuous increase of number of views, the video spotted at #5 at MOST VIEWED in ALL CATEGORIES and #2 at MOST VIEWED in ENTERTAINMENT CATEGORIES (Saturday afternoon September 1, 2012) then Saturday night it was on YouTube MOST POPULAR VIDEOS in the Philippines. The video received comments from different people and students from different schools even from different countries. As Far Eastern University (FEU) celebrates the "Buwan ng Wika", the Far Eastern University Central Student Organization (FEUCSO) hosted an Inter-Institute of Humorous Monologue competition last August 29, 2012. The Institute of Arts and Sciences Student Council (IAS SC) President Rizanne Ramos personally pick Edgardo Abaan Jr. (popularly known as "Ann") to represent IAS in the said competition. Edgardo ended up as 1st Runner-Up in the competition. Institute of Nursing (IN) got the Championship title and Institute of Accounts, Business and Finance (IABF) got the 2nd Runner-Up.